“Cinnamon Rolls” The Sequel! If you want to impress your guests with your fine cooking skills and great food presentation, I have just the thing. The only bad thing about this recipe is that people might not want to bite into these little things, afraid of destroying their beauty. Anyway, start by warming up your milk, add yeast and a bit of sugar and let it activate. In the bowl of your mixer, add melted butter, eggs, salt and ¼ cup of sugar. Mix for a bit then add the milk and yeast mixture. At this point you can start adding your flour, one cup at a time. When is solid enough, take it out and knead for a minute. Let the dough rise for a couple of hours until it doubles in size. Back on the dough, cut it into 24 little pieces and roll each one into a ball. Take 4 balls at a time and roll out each one into a circle so that it’s about 3 inches (7.5 cm) in diameter. Place the circles on top of each other from the middle down as in the picture below and top with one or two tablespoons of the cinnamon sugar mix, spreading it evenly over each circle. Start at the bottom and roll the thing all the way up. You don’t need to pinch the sides. This will make two roses. Take a knife and cut exactly down the middle. Place the roses cut side down, in a well buttered muffin tray. Let the cinnamon rolls sit for another 20 to 30 minutes, you will notice they will continue to rise. 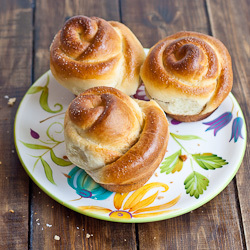 Brush the rolls with egg wash and sprinkle with some sugar before baking. Bake in a preheated oven at 375° F / 190° C for about 25 to 35 minutes, or until golden brown. This is it! I hope you made enough because people are going to fight for them. :D Enjoy! Get a small bowl add the warm milk, yeast, one tsp of sugar and let the yeast activate for 10 minutes. In the mixing bowl of your mixer add the melted butter, ¼ cup of sugar, eggs, salt and mix well. Now add the yeast mixture and give it a swirl. Add a cup of flour at a time and mix until you’ve finished all the flour. When everything is well incorporated, take it out and knead for a minute. Oil the dough a bit so it doesn't dry up, cover it up with a cloth or plastic wrap and let it rise for about two hours, until it doubles in size. In a small bowl mix the sugar, brown sugar and the cinnamon. Cut the dough in 24 little pieces, and roll out each piece into a ball. Take four balls at a time and roll out each one into a disc so that it’s about 3 inches (7.5 cm) in diameter, 0.2 in (0.5 cm) thick. Place the discs on top of each other from the middle down and top with one or two tablespoons of the cinnamon sugar mix, spreading it evenly over each one. Starting at the bottom, start rolling the discs until you’ve rolled all the way up. You don’t need to pinch the sides. Take a knife and cut exactly down the middle. Place the roses cut side down, in a well buttered muffin tray. Let the cinnamon rolls sit for another 20 to 30 minutes, so they can rise a bit more. Brush the rolls with egg wash and sprinkle with some white sugar before baking. What beautiful roses! I can imagine how sweet the kitchen will smell as I bake these pretty treats! Thanks for sharing! That is such a good idea, I wouldn’t have thought to make cinnamon buns that way.